Author contributions: Mederos MA and Villafañe N designed the report and wrote the paper; Amy M assisted in writing and editing the paper; Fisher WE assisted in writing and editing the paper; Van Buren II G performed the surgery, collected the patient’s clinical data, designed the report and wrote the paper; Dhingra S reviewed the pathology, selected the images, and wrote the paper; Farinas C reviewed the imaging, selected the images, and wrote the paper. Institutional review board statement: After approval from the institutional review board through Baylor College of Medicine tissue and clinical information was obtained. Informed consent statement: The patient provided informed consent for the study. Conflict-of-interest statement: None of the authors have any conflict of interest. Pancreatic cysts include a variety of benign, premalignant, and malignant lesions. Endometrial cysts in the pancreas are exceedingly rare lesions that are difficult to diagnose pre-operatively. This report describes the findings in a 43-year-old patient with a recent episode of acute pancreatitis who presented with a large cyst in the tail of the pancreas. Imaging demonstrated a loculated pancreatic cyst, and cyst fluid aspiration revealed an elevated amylase and carcinoembryonic antigen. The patient experienced an interval worsening of abdominal pain, fatigue, diarrhea, and a 15-pound weight loss 3 mo after the initial episode of pancreatitis. With concern for a possible pre-malignant lesion, the patient underwent a laparoscopic distal pancreatectomy with splenectomy, which revealed a 16 cm × 12 cm × 4 cm lesion. Final histopathology was consistent with an intra-pancreatic endometrial cyst. Here we discuss the overlapping imaging and laboratory features of pancreatic endometrial cysts and mucinous cystic neoplasms of the pancreas. Core tip: Intra-pancreatic endometrial cysts are an exceedingly rare entity. Imaging and laboratory assessments are valuable tools for diagnosing pancreatic cysts. However, pre-operative diagnosis of pancreatic endometrial cysts remains problematic. These lesions have overlapping radiographic and laboratory features with premalignant lesions, such as mucinous cystic neoplasms. Due to the diagnostic similarities between these rare endometrial cysts and the more common mucinous cystic lesions, the optimal diagnostic and therapeutic option is resection. Pancreatic cysts encompass a variety of benign, premalignant, and malignant lesions. Accurate pre-operative diagnosis of these cysts can pose a challenge[1-4]. Imaging, laboratory findings, and patient history often assist in classification of the lesion[1-4], however, definitive diagnosis is often made with surgical resection. Intra-pancreatic endometrial cysts are a rare entity. The most common sites of endometriosis are the pelvic organs; however, endometriosis of the upper abdominal organs has been described[1,6-15]. A literature review identified 12 previous cases of pancreatic endometriosis[1,6-15]. Each of these patients underwent surgical resection because a malignant or pre-malignant lesion could not be ruled out. Due to the rarity of these lesions, there are no established radiographic or laboratory studies to help differentiate endometrial cysts from the more common and precarious premalignant pancreatic lesions, especially in the pre-menopausal age range. A 43-year-old obese Caucasian female presented to clinic for surgical evaluation of a pancreatic cyst. Three months prior to this visit, the patient was admitted to an outside hospital with one day of severe epigastric pain. She was found to have an elevated serum amylase and diagnosed with acute pancreatitis. Her imaging with a computed tomography (CT) scan during her initial hospitalization for pancreatitis revealed an 8 cm × 10 cm pancreas cyst with wall thickening and loculation in the pancreatic tail abutting the posterior stomach, spleen, and left renal hilum. Further evaluation with endoscopic ultrasound (EUS) demonstrated a 10 cm × 6 cm mass, and fine needle aspiration of brown fluid revealed a high amylase (> 1000 U/L) and elevated carcinoembryonic antigen (CEA) (951 ng/mL). Serum CEA and cancer antigen 19-9 were within normal limits. At this clinic visit, the patient reported worsening abdominal pain, fatigue, diarrhea, anorexia, and a 15-pound weight loss since her initial episode of pancreatitis. She denied having fever, blood in the stool, or hematemesis. Her medical history was significant for type 2 diabetes, hyperlipidemia, non-alcoholic fatty liver disease, and endometriosis. She had a past surgical history of an uncomplicated caesarian section. She denied abdominal trauma, cyclical/intermittent pain, chronic alcoholism, or episodes of pancreatitis prior to the recent episode; she had no history of previous medical or surgical therapy for her endometriosis. The patient had regular monthly menustral periods with no exacerbation of pain. There was no family history of pancreatic cancer, but her mother did have gallstone pancreatitis. Repeat imaging at this visit revealed interval enlargement of the lesion. Axial, coronal and sagittal CT images (Figures 1 and 2) demonstrated a 10.0 cm × 11.1 cm × 16.5 cm macrocystic, thin walled, well circumscribed fluid density mass with a few internal septations and locules, which arises from and replaces the pancreatic body and tail. This mass abuts the stomach in its superior aspect and the spleen in its lateral aspect. Post-contrast images did not show evidence of internal enhancement. Mural nodules or other solid components were not identified. Figure 1 Axial computed tomography images. Axial computed tomography (CT) images in unenhanced (A), pancreatic (B) and portal venous phase (C) show a well circumscribed, thin walled, large fluid density cystic lesion arising from and replacing the pancreatic body and tail, which abuts the spleen. The lesion does not exhibit post-contrast enhancement. Axial CT image at a lower level in portal venous phase (D) shows several thin septations and small loculations (arrows). Figure 2 Coronal (A) and sagittal (B) images in portal venous phase show the same lesion abutting the stomach in its superior aspect. Thin septations and small loculations are again noted (arrows). The initial presentation of a cystic lesion in the setting of pancreatitis can be concerning for pancreatic pseudocyst; however, the presence of the cystic lesion at the time of the initial presentation of pancreatitis, the interval enlargement, multilocular appearance, and elevated cystic CEA were concerning for a premalignant pancreatic cystic lesion. Thus, a decision was made to proceed with resection as opposed to a drainage procedure. Diagnostic laparoscopy revealed a large, 16 cm cyst in the pancreatic tail adherent to the spleen, left kidney, and diaphragm. Significant fatty liver disease and omental inflammation were noted. The ovaries, Fallopian tubes, and uterus appeared normal without evidence of endometriosis. A laparoscopic distal pancreatectomy and splenectomy was then performed. Gross evaluation of the specimen revealed a 16 cm × 12 cm × 4 cm unilocular cyst containing gray-green cloudy fluid. The cyst wall was smooth, trabeculated, gray-brown with focal areas of hemorrhage. No papillary projections were seen. Histological examination showed cyst wall lined by benign cubo-columnar epithelial lining resting on a cellular stroma composed of bland spindle cells associated with thin walled blood vessels (Figure 3). This cyst was considered intra-pancreatic because pancreatic tissue was present in the wall of the cyst without a fat plane. The spindloid stroma enclosed few scattered benign glands and groups of hemosiderin laden macrophages (Figure 4). 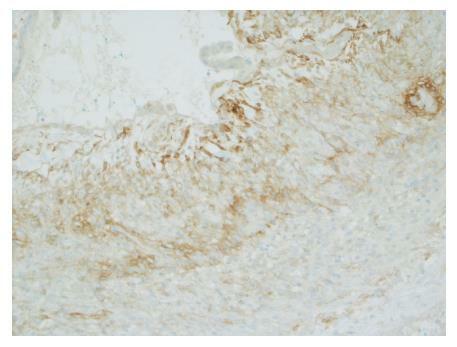 Immunohistochemical evaluation revealed the spindle cell stroma to be positive for CD10 (Figure 5), estrogen receptor and negative for inhibin (Figure 6). These features were consistent with cystic endometriosis. Figure 3 Cyst wall lined by bland cubo-columnar epithelium resting on a layer of cellular spindle cell stroma with thin walled blood vessels. Hematoxylin and eosin staining, magnification × 100. Figure 4 Cellular stroma shows bland spindle cells enclosing few benign glands and hemosiderin laden macrophages. Hematoxylin and eosin staining, magnification × 200. Figure 5 Positive staining for CD10 in the cellular spindloid stroma. Immunohistochemical stain for CD10, magnification × 100. Figure 6 Negative staining for inhibin in the cellular spindloid stroma. 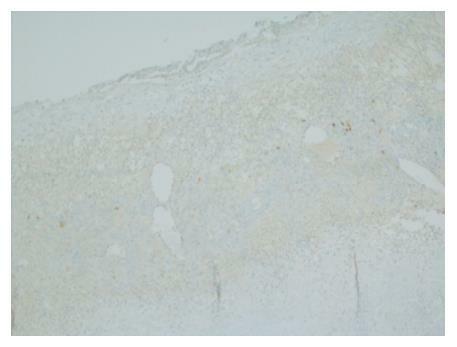 Immunohistochemical stain for inhibin, magnification × 100. After surgery, the patient had an uncomplicated hospital course, and she received post-splenectomy vaccinations. Her post-operative recovery was uncomplicated. On further questioning, the patient relayed a distant history of endometriosis. She claimed endometrial pain in the past however at the time of the operation she was having regular menstrual periods with her last menstrual period three weeks prior to the operation. At 16 mo from surgery the patient was doing well without any abdominal pain recurrence. Pancreatic cysts include a variety of benign, premalignant, and malignant lesions. The expanded differential diagnosis for this case includes Mucinous cystic neoplasm (MCN) of the pancreas, pancreatic pseudocyst, serous cystadenoma, serous cystadenocarcinoma, solid pseudopapillary tumor, cystic pancreatic adenocarcinoma, cystic pancreatic neuroendocrine tumor, and ectopic tissue. Endometrial cysts in the pancreas are exceedingly rare lesions that are difficult to diagnose pre-operatively[1,6-15]. This report describes the findings of a giant endometrial cyst of the pancreas in a patient with a recent episode of acute pancreatitis. Endometriosis is the presence of endometrial glands and stroma outside the uterus. This disease is characterized by recurrent pain that is commonly associated with the menstrual cycle. There are multiple theories for the pathogenesis of endometriosis, which include direct extension, menstrual regurgitation, lymphatic/vascular spread, and coelomic metaplasia. The most common sites of endometriosis are the pelvic organs; however, endometriosis of the upper abdominal organs has been described[1,6-15]. Endometrial cysts of the pancreas remain an exceedingly rare entity. There have been a total of only 12 cases described in the literature[1,6-15]. The most common presumptive diagnosis was a neoplastic cyst based on imaging and laboratory assessments. Pre-operative suspicion for an endometrial cyst was low in all but one case. In that case report, the patient did have a gynecologic history of endometriosis as well as a previous caesarian section for her one child birth. She had never required any medical or surgical therapy for her disease. She did not relate any of her abdominal symptoms to her menstrual cycle or hormones. The initial impression of the lesion was that it was likely a MCN of the pancreas due to its location in the pancreatic tail. A pancreatic pseudocyst was less likely since the temporal relationship with the episode of acute pancreatitis was not standard. Classically, pseudocysts develop after episodes of acute pancreatitis in a progressive fashion from peri-pancreatic fluid collections, to walled off fluid collections, to pancreatic pseudocysts[16,17]. Pancreatic pseudocyst formation occurs over a six to eight-week period after the initial episode of pancreatitis. These lesions are round fluid collections with a relatively thick and well-enhancing wall of fibrous tissue[16,17]. Radiologically, they present as extra-pancreatic lesions without septation, loculations, solid components, or wall calcification. They may communicate with the pancreatic duct on magnetic resonance pancreatography or EUS. Cyst fluid analysis often reveals elevations in amylase and lipase, but normal CEA levels[2-4,16,18]. In this case, the pancreatic cystic lesion was present at the time of the initial diagnosis of the episode of pancreatitis, and the patient had no previous episodes of pancreatitis. The incorrect temporal relationship of the cyst to the pancreatitis and abnormally elevated cyst CEA were concerning for an alternative diagnosis. MCN are lesions with malignant potential that are predominantly seen in middle-aged females[2,16]. About 90% of these lesions present in the tail of the pancreas and can exceed 20 cm in the greatest dimension. On imaging, MCNs have a smooth contour and wall enhancement. They may present with multiloculations, thick internal septae, papillary or nodular excrescences, and wall calcifications[2,16]. Multiple loculations and size > 5 cm have been shown to correlate with an invasive component and malignant transformation. Histologically, the MCN is lined by mucinous epithelium with varying degree of dysplasia, resting on a layer of cellular ovarian-like stroma[17,19]. The ovarian-like stroma on microscopy can resemble endometrial stroma; however, by immunohistochemistry the ovarian-like stroma with MCN is often positive for inhibin, estrogen receptor and progesterone receptor[1,19]. 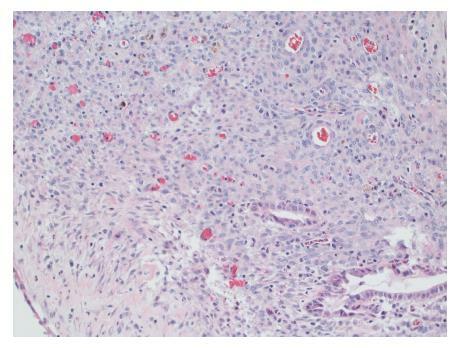 The stroma is negative for CD10, which is an immunohistochemical marker of endometrial stroma. An elevated cyst fluid CEA often helps to differentiate mucinous from non-mucinous lesions[3,4,16]. In one study, a cyst fluid CEA cutoff of 109.9 ng/mL was both sensitive (81%) and specific (98%) for mucinous lesions. According to another systematic review, a CEA > 800 ng/mL is strongly associated with a mucinous lesion with a specificity of 98%. In this patient, the cyst was 16 cm in the largest dimension with loculations. Cyst aspiration demonstrated an elevated CEA of 951 ng/mL. These findings, in addition to the patient's age and gender, supported a presumptive diagnosis of a premalignant mucinous cyst. Classically, MCNs do not have elevated cyst amylase levels due to the fact that the lesions are not directly connected to the pancreatic duct[2-4,16-18]. In this setting, the EUS did reveal an elevated amylase which confounded the diagnosis of a possible MCN. Furthermore, MCNs can be confused with pseudocysts intraoperatively and histopathologically. MCNs may contain purulent material and demonstrate ovarian stroma that resembles the granulation tissue of pseudocysts[2,18]. However, given the elevated CEA, we felt the most likely preoperative diagnosis MCN. In all but one case reported in the literature, the presenting symptom with pancreatic endometrial cysts was abdominal pain[1,6-15]. Less than half of these cases correlated pain with the patients' menstrual cycles, and only one case had a presumptive diagnosis of endometriosis. In that report, the authors suggest pancreatic endometriosis can be recognized with magnetic resonance imaging (MRI) based on a hyperintense T1 signal with fat suppression, which is suggestive of blood components. Although the MRI was suggestive of endometriosis, the authors noted that the findings were not conclusive. EUS with fine needle aspiration is a reasonable test when imaging is equivocal. In this present case report, the elevated cyst fluid CEA warranted surgical resection. 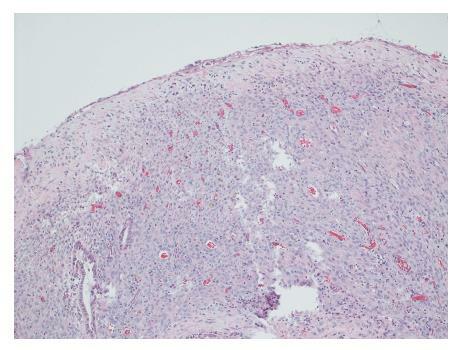 An elevated cyst fluid CEA was reported in only one other report of a pancreatic endometrial cyst (940 ng/mL). In conclusion, a wide variety of benign, premalignant, and malignant pancreatic cysts exist. Pancreatic endometrial cysts remain a very rare entity. Currently, there is no reliable method of detecting endometrial disease of the pancreas pre-operatively. Pancreatic endometrial cysts can present with elevated cyst CEA. Due to the diagnostic similarities between these rare endometrial cysts and mucinous cystic lesions, the optimal diagnostic and therapeutic option is resection. 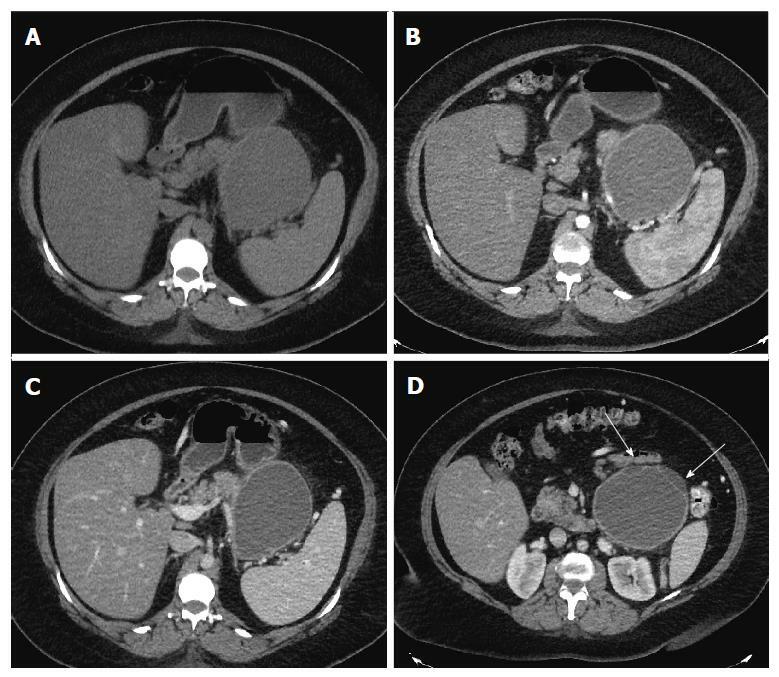 A 43-year-old obese Caucasian female with a history of type 2 diabetes, hyperlipidemia, non-alcoholic fatty liver disease, and endometriosis presented for surgical evaluation of a large pancreatic cyst discovered during an admission for acute pancreatitis. Mild left-sided tenderness to palpation without rebound or palpable masses. Cyst fluid analysis from endoscopic ultrasound with fine needle aspiration demonstrated an elevated elevated carcinoembryonic antigen and amylase of 951 ng/mL and > 1000 U/L, respectively. Computed tomography demonstrated a 10.0 cm × 11.1 cm × 16.5 cm macrocystic, well-circumscribed fluid density mass containing a few internal septations and locules within the pancreatic body and tail. Endometrial cysts in the pancreas are exceedingly rare lesions that are difficult to diagnose pre-operatively. This entity is easily confused for a mucinous cystic neoplasm or some other pre-malignant lesion due to similar radiographic and laboratory features. Endometriosis is the presence of endometrial glands and stroma outside the uterus. Pancreatic endometriosis is easily confused for a malignant or pre-malignant lesion based on imaging and laboratory studies. This diagnosis should be considered in the differential in pre-menopausal women experiencing recurrent or worsening abdominal pain in the setting of a pancreatic cyst on imaging. Without a reliable method to diagnose pancreatic endometriosis pre-operatively, surgical resection is recommended. A wide variety of benign, premalignant, and malignant pancreatic cysts exist. Pancreatic endometrial cysts remain a very rare entity. Due to the diagnostic similarities between these rare endometrial cysts and mucinous cystic lesions, the optimal diagnostic and therapeutic option is resection.